The must have radio with up to the minute weather reports! The AM/FM Weather Band radio delivers high quality audio and around the clock weather reports. 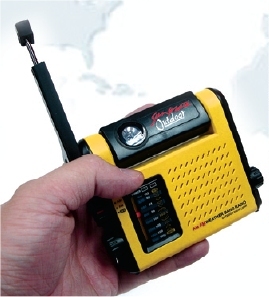 Well built for everyday use, this compact radio is the perfect size to take with you wherever you may go. Its durable construction makes it ideal for use in emergencies like power outages, hurricanes, earthquakes or more. Edeal for emergencies - Power Outages, Hurricanes, Earthquakes and more.